Remco Products and Vikan will present a series of short technical food safety seminars at the 2018 IAFP convention. Four speakers will present on seven different hygiene and sanitation topics. Each of these short, 20-minute presentations will take place in our booth, #1013. Presentation topics include dry cleaning, allergen control, regulations, and sanitation. Each speaker will answer questions after their presentations, and many will be available to speak to throughout the show. Karl Thorson, food safety and quality manager at General Mills, will deliver a presentation about the company’s “war on water” and their efforts to improve the dry cleaning process. Stine Lønnerup Bislev, hygiene and compliance manager at Vikan A/S, will present on listeria and cleaning tools, along with GFSI standards and what they say about cleaning tools. Dr. Gene Bartholomew, food safety consultant at Smithfield Foods, will cover validation vs. verification in regards to hazard control in SQF and other GFSI food safety schemes. Melody Ge, senior consultant at Kestrel Management, will deliver a presentation on sanitation as a preventive control for FSMA and how it fits into GFSI compliance, and give tips on how to build a sanitation program. 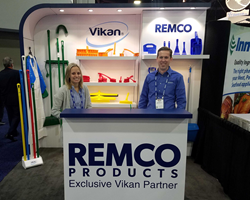 To see the schedule of presentations and learn more about the speakers or Remco Products and Vikan, please visit remcoproducts.com/IAFP2018. Remco Products provides specialized color-coded tools for cleaning and material handling where hygiene and safety are critical. In addition to its hygienic tools, Remco features Vikan’s advanced line of brushes, brooms, and squeegees. Regardless of an operation’s size or complexity, Remco has the tools and expertise to help execute food safety and sanitation plans. Based out of Denmark, Vikan is one of the world’s leading manufacturers of maximum hygiene cleaning tools with over 115 years of brush-making experience. They develop, produce, and sell a broad range of cleaning solutions to meet the needs of their customers and comply with statutory law.